Lemons are rich in vitamin C and aids in improving the immunity of your uterus. Drink a glass of warm water with a lemon juice daily in the morning to improve the health of your uterus. Green leafy vegetables help to maintain the alkaline balance of your uterus. 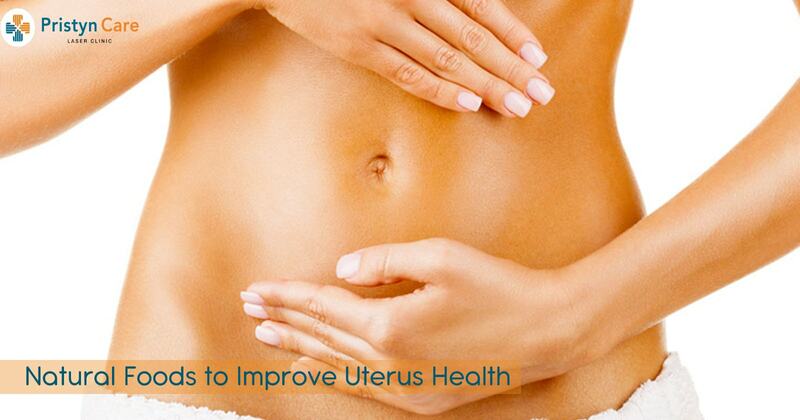 Nutrients and folic acid present in greens make your uterus healthy. Seeds and nuts are helpful in optimal production of hormones. Eat almonds, flaxseeds and cashew nuts as they are rich in omega-3 fatty acids which help in removing fibroids and prevent uterine cancer. Being a rich source of calcium, potassium, magnesium, and vitamins, vegetables keep those nasty fibroids at bay. Fruits, rich in vitamin C and bioflavonoids may help in delaying the growth of fibroids in your uterus and controls your estrogen levels. Dairy products are rich in calcium and vitamin D and are very essential for uterine health. Eat yogurt, cheese, milk, and butter to keep the uterine fibroids away. Fishes like mackerel and salmon are rich in omega-3 essential fatty acids and help to reduce the production of prostaglandin that may cause severe contraction of the uterus. Intake of castor oil can treat ovarian cysts and uterine fibroids. The ricinoleic acid in castor oil strengthens your immune system and makes the uterus more resistant to infections. Include these foods in your diet to get a healthy uterus.